Plan the perfect holiday visit now! It’s time to make plans now for the perfect holiday visit during Vintage Christmas in Portsmouth throughout the entire month of December 2012. Presented by cultural anchors Strawbery Banke Museum and The Music Hall, it’s a month of Strolls, Shows and Stayovers in the historic working seaport of Portsmouth, New Hampshire. Listed as “one of the Top 100 Events in North America” (ABA) and “one of the Top Ten Things not to miss in New England” (Boston Globe), Vintage Christmas in Portsmouth has people returning year after year to the small city that Travel Guide of America calls “the crowning glory of the New Hampshire Seacoast.” Now in its eighth year, Vintage Christmas in Portsmouth will once again offer the irresistible Candlelight Stroll that Strawbery Banke Museum has created for 32 years, the live holiday shows, opera broadcasts and films in The Music Hall’s landmark Historic Theater and the intimate Music Hall Loft on Congress Street, and the welcoming stays in the elegant and delightful holiday downtown. Get ready to cuddle up with a free trolley ride through red-bricked Market Square, stroll through the snowflakes to the many eclectic shops, step back in time through living history at the festively decorated Strawbery Banke Museum, sample Portsmouth’s famous culinary specialties, or enjoy a first-class show at The Music Hall. Back by popular demand – the free Vintage Christmas Trolley shuttles patrons around the historic seaport each Saturday and Sunday afternoon and evening for the first three weekends in December. Joining the two nonprofits this year will be Presenting Sponsors Churchill’s Garden Center; the City of Portsmouth; Greater Portsmouth Chamber of Commerce; Seacoast Media Group; and The White Apron. Lead Sponsors include Holloway Automotive; Seacoast Local; and Weather Partner 107.1 WERZ. Great Bay Academy of Dance, which produces An 1836 Portsmouth Nutcracker at The Music Hall’s Historic Theater, will be participating as a Community Partner. A handy calendar/map will be available to visitors to make it easy to get around town. 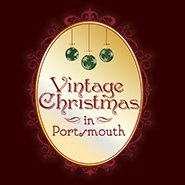 Vintage Christmas in Portsmouth also has its own website, VintageChristmasNH.org to make it even easier for visitors to plan their trips. The map/calendar will also be available on the site to download. The free city trolley is wildly successful. Patrons use it to not only ferry themselves from free parking lots to the center of town, between The Music Hall and Strawbery Banke Museum, but also to give themselves a brief overview of what Portsmouth has to offer. The trolley’s scheduled route – to run the first three weekends of December on Saturday and Sunday from 1:30-10:30pm – is a quick 20-minute loop with several stops to jump on/off for shopping, and to get a bite to eat and drink. Day visitors will be able to park at various lots around town and jump on the trolley, while overnight visitors in downtown hotels will be able to walk to convenient trolley stops. Historic Theater: Step over the threshold of this landmark Victorian theater – the oldest in New Hampshire – and into the Beaux Arts Founders Lobby featuring superlative patron amenities. Upstairs, the newly renovated upper lobby leads into the elegant 900-seat auditorium – now restored to its 1878 splendor – has welcomed artists ranging from Mark Twain to Buffalo Bill Cody’s Wild West Show. Patrons greet friends and neighbors in this community great room, a gathering place for conversation on a site dating back to the days of Frederick Douglass. The original hardwood floor and horseshoe balcony ensure superior acoustics for stage and screen events. Full concessions are available in both lobbies. Just around the corner from the Historic Theater, the Music Hall Loft features the same fabulous programming, but in a smaller more intimate (125-seat) setting, with gourmet food and cocktails that can be taken right to each seat. Weather: Tune in to 107.1 WERZ for your Vintage Christmas Weather Update on Saturday and Sunday mornings. Ticket prices for Strawbery Banke Museums’ Candlelight Stroll are $20 for adults, $10 for children, and $50 for families (2 adults and their children ages 17 and under). Tickets can be purchased online at http://www.strawberybanke.org or by phone at 603.433.1107. Tickets may be used any night of the Stroll.